Well folks, we have arrived at the 299th episode of Supernatural – what a milestone! Though there is a lot in store for next week’s 300th episode celebration, “Prophet and Loss” had to get some major storyline work done this week to set up for it. Brad Buckner and Eugenie Ross-Leming did a great job in tying up some loose ends, solving a case, and bringing the mega emotional moments this episode. Let’s dive in! The episode begins under the ocean — the Mal’ak box built to contain Michael (and Dean, by proxy) has sunk to the bottom, and inside we find our hero very much awake, attempting to punch his way out. It’s gut wrenching to watch Dean reduced to tears, blood pooling under his fingertips as he cries out for Sam and watches, horrified, as his phone battery dies. He’s completely trapped, and no one is coming to save him. And then he wakes up from that nightmare, thankfully. Sam unintentionally made some noise walking back from the bathroom, and Dean does his best to hide his post-panic emotions, as well as the actual blood under his fingertips from scratching the wall beside his bed. Sam knows though, and he tries to get Dean to talk out his feelings, but he doesn’t see any point to it. Scared or not, Dean knows this is how it was written in Billie’s book. So this is how it has to go down. Somewhere else in a super creepy warehouse, a woman is bound and lying down while her captor prepares water in some kind of giant tub. She’s picked up and placed into it, and then he proceeds to carve into her wrists while she cries. It is terrifying to watch as he pushes her under, the blood filling the water as she struggles and ultimately dies. On the one hand, my heart was in my throat, but on the other, it’s good to know that even after 14 seasons, Supernatural can still scare the heck out of me. In the hospital from last episode’s Donna-induced injury, Nick is melancholy. The guard taunts him with how long he’s going to go to prison, and Nick insists that it was Lucifer’s possession that made him commit his crimes. You almost believe him. Almost. Dean and Sam make a pit stop on their way out of town. Dean basically repeats what he said the night before — that he’s made up his mind, and even thought he doesn’t like it, he is going to go through with his plan. He hasn’t even told Cas or Jack, because he doesn’t want to get “shaky.” He asks if Sam is still on board with the plan, and he insists that he is. But as soon as Dean gets out of the car, Sam is on the phone calling Cas. Of course Sam has told Cas of Dean’s insane suicide mission, and Castiel has been working at the bunker trying to find a way to save Dean. (I have to admit that I cheered a little when I saw this, because I was really afraid that Sam wasn’t going to try to leverage the resources he has.) Castiel asks Sam if he could try talking to Dean, but Sam insists that he’s never seen Dean so single-minded before. The same bad dude from earlier has found another victim. This time, he drags the poor guy into the middle of a warehouse and slits his throat. After he bleeds out, the evil guy carves something into his chest. “I am the Lord,” he says, looking creepily euphoric. We flash back to Nick briefly to watch him cunningly convince the guard to uncuff him long enough to use the bathroom. Not surprisingly, he takes the opportunity to get the upper hand on him, and with the guard down on the ground, Nick proceeds to kick the crap out of him and then escape. 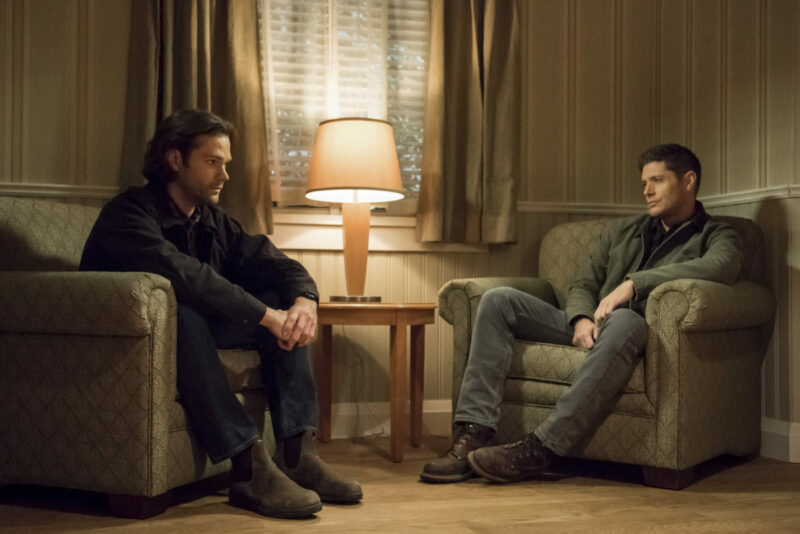 Back with the brothers, Sam has found them a case he claims is “on the way.” At first, Dean is hesitant to deviate from his current (dumb) plan, but then he relents, saying “One last case for the Winchester brothers,” which only upsets Sam more. The case is clearly about the guy we’ve seen murder two people earlier in the episode. They arrive at the male victim’s twin brother’s house (Alan) to ask him questions. Before they get much information, Alan talks about how awful it is to have lost his brother, and how he feels like he lost a part of himself. Sam and Dean already know how awful it’s going to be to lose one another. Luckily, Alan recognizes the “graffiti” that was carved into his brother (which was actually Enochian writing) — an old friend of theirs named Tony has a tattoo on his arm with the same design. Dean calls Castiel, who is thrilled to hear from him. Dean tries to get off the phone quickly, but Castiel quickly reveals that he knows about Dean’s suicidal plan and that they need to have a talk. Dean is visibly aggravated (he knew Castiel would try to talk him out of it) but finds out from Castiel that Tony is actually next in line to be prophet after Donatello (who is currently in a vegetative state since the events of season 13’s episode “Good Intentions“). They find Tony’s house, and inside, the walls are covered in Enochian writing outlining each method he is going to use to carry out the murders. The next plan is to set someone on fire. In one of the pictures Tony had taken of his victims, the guys see the name of a warehouse, and they arrive at said warehouse just as Tony has dropped a lit match on a line of gasoline that surrounds another victim. Sam runs to take him out, while Dean douses the flame and frees the hostage. Sam and Dean insist that what Tony is hearing is not God, and that none of the murders that he has carried out are ordered by anything divine. Shocked and dismayed, Tony grabs a gun in the commotion and takes himself out. Sam calls Castiel to talk about how this guy became a prophet with a screw loose. Technically, Donatello is still alive, and so Castiel determines maybe there is something wrong with the natural order, because the current prophet is straddled between worlds. The only solution then of course, is the worst possible option: they must murder Donatello. Nick has returned to his family’s home, and he is plagued by haunting visions of their deaths. Classic signs of a ghost start happening: the air turns cold, lights flicker, doors move. In a flash, a woman in a white gown appears with a smile. “Lucifer?” Nick asks, his expression hopeful. “No, it’s your wife, Sarah,” she replies. And it is not exactly a happy reunion. Though it seems that way at first, Sarah is tied to the house because of unfinished business — namely, that Nick chose Lucifer all those years ago. All she needs him to do for her to move on is to reject Lucifer. But he won’t — not even to help his wife go to a better place. He walks away to continue his search for Lucifer, leaving her tethered to the house. Of all the cruel things we have seen Nick do this season, this might be the very worst. Sam and Dean arrive at the care facility where Donatello is being kept alive by machines. They the meet with Dr. Rashad, who insists that allowing Donatello to pass naturally is the most humane option. “What a coincidence, you’ve arrived at the same time as Doctor Novak,” Dr. Rashad remarks. Castiel comes from around the corner in a lab coat, and tells the doctor he is familiar with “both Mr. Winchesters.” Dr. Rashad continues informing them (while clearly missing how they’re all trying to keep a straight face) that there are no signs of life from Donatello, other than the occasional babbled word. They follow him to see video, but Castiel stops Dean. He tells him that, although what he did to Donatello had to be done, he still regrets it. Dean says that he can relate, but Castiel shuts him down — he is pissed that Dean is still trying to go through with his plan. Dean insists that if Castiel were a true friend, he would just support his decision. This is a load of crap of course, but hey, it’s straight from the Winchester playbook. While Castiel works his angel mojo, Dean and Sam wait outside. Sam is still struggling with Dean’s decision, but Dean tells him to stop thinking about it. “Thinking is highly overrated,” he says, so completely on brand for Dean. Except that it isn’t actually easy for Dean to stop thinking, and he is truly scared to death. When they rejoin Castiel, he is still trying to heal Donatello and then suddenly, after searching for whatever he was looking for, he finds it. With a spark of blue, Donatello is brought back to life. Dean leaves Castiel to explain to Donatello (who is not evil, but still soulless) exactly what has happened, and he joins Sam outside. Sam has grabbed some beers to celebrate their win, and Dean’s excited to “go out on a high.” (Cue me groaning — shut up about the farewell tour Dean, it’s killing us!) And that’s about all she wrote for Sam — he’s had enough. All of the times Dean has pushed and insisted they never give up in order to save one of them, or to save the world, and here he is throwing in the towel because he is being told that it’s the only card he has to play. Sam’s pissed, and rightfully so — they always find another way, there’s always another fix. “We’re the guys that save the world, and you don’t get to check out of it!” he yells at his brother — and then hits him in the face. Dean catches his next punch and Sam just collapses against him, hurt and angry. Sam’s feelings are so relatable, as the rest of us are sick of watching Dean actually agree with Billie that his fate is sealed. This move is so classic Dean: he has never fully appreciated his own worth. Even as he concedes to Sam (and Castiel, as he approaches them) that he won’t give up yet, there is a hint of him doing this, not because he cares about his own well being, but because he cares about how upset Sam and Castiel would be if he went through with his mission. This episode was full of great emotional moments for Team Free Will – but next week is the 300th episode! We already know some of what to expect, but there’s sure to be lots of surprises! What are you looking forward to? Let us know in the comments below! “Rogue One: A Star Wars Story” Coming to Digital HD March 24, DVD/Blu-ray on April 4!